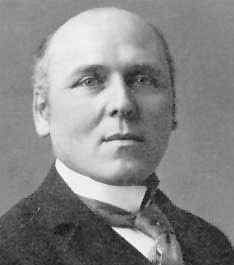 Howard Pyle was born in Wilmington, Delaware (Brandywine Valley) on March 5th, 1853. After short stints at schools like the Friends' School , Howard's parents allowed him to begin studying art instead of going to college. When he was sixteen, Howard began three years of study with the Belgian artist Van der Weilen. Howard returned home, helped his father in the family business, and continued to practice drawing. In 1876, Howard sent a set of verse, with illustrations, to Scribner's Monthly. They were accepted, and Howard then submitted a fairy tale to a children's magazine, Saint Nicholas, in 1877, which was, again, accepted. Spurred on by these successes and encouraged by his father, Howard left for New York late in 1876. By the age of twenty-five, Howard's work was in demand. He returned to Wilmington to live with his family and work from there. In 1881, Howard married Anne Poole. In 1883, Howard published his first book for children, The Merry Adventures of Robin Hood of Great Renown in Nottinghamshire . Other books stories followed, including Howard Pyle's Book of Pirates, but it was Howard's four-volume series about the adventures of King Arthur that cemented Howard's reputation. The books in the series were: The Story of King Arthur and His Knights (1903), The Story of the Champions of the Round Table (1905), The Story of Sir Launcelot and His Companions (1907), and The Story of the Grail and the Passing of Arthur (1910). In 1894, at the age of forty-one, Howard began his teaching career and in 1900 began the Howard Pyle School of Art, eventually creating the Brandywine School and Artists Colony in Chadd's Ford, Pennsylvania, where he taught artists like N. C. Wyeth, Frank Schoonover and Thornton Oakley. In 1910, Howard relocated to Florence, Italy to paint murals. Howard died of a kidney infection on November 9th, 1911 in Florence, Italy. Other works include: Within the Capes (1885), Pepper and Salt, or Seasoning for Young Folk 1887), The Rose of Paradise (1887), The Wonder Clock or Four and Twenty Marvelous Tales (1888), Men of Iron, a Romance of Chivalry (1892), Jack Ballister's Fortune (1894), Twilight Land (1895), and The Garden Behind the Moon (1895). Tale of Robin Hood, the loveable rogue who stole from the rich in order to give to the poor, and his followers, the Merry Men, including Little John.